supplementary or affording aid to another similar and generally more important thing. 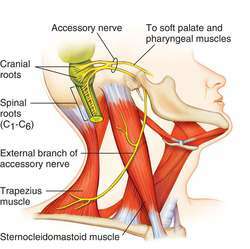 accessory nerve the eleventh cranial nerve (called also spinal accessory nerve); it originates in the medulla oblongata and provides motion for the sternocleidomastoid and trapezius muscles of the neck. 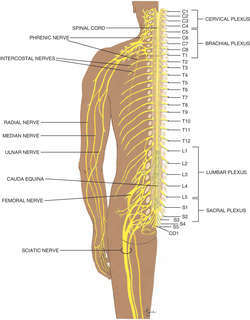 See anatomic Table of Nerves in the Appendices. 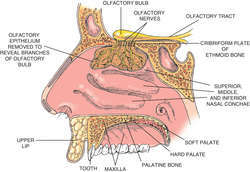 either of a pair of cranial nerves essential for speech, swallowing, and certain movements of the head and shoulders. 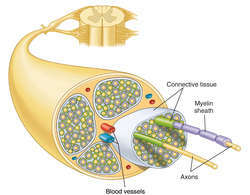 Each nerve has a cranial and a spinal portion, communicates with certain cervical nerves, and connects to the nucleus ambiguus of the brain. Also called eleventh cranial nerve, nervus accessorius, spinal accessory nerve. A nerve of the neck. Roots in lateral medulla oblongata and upper spinal cord. After multiple roots join, the AN divides into internal (cranial) and external (spinal) branches. Internal branch innervates vagus—palate, pharynx, larynx, thoracic viscera; external branch innervates sternocleidomastoid and trapezius muscles. AN lesions cause drooping of the shoulder and inability to rotate the head away from the affected side. 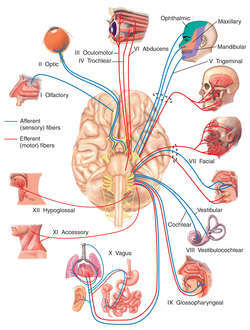 One of the eleventh of the 12 pairs of cranial nerves which arise directly from the BRAIN. 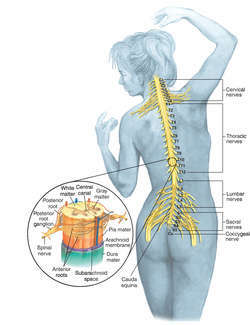 The accessory nerve also has a spinal root. Fibres from the root from the brain join the vagus nerve. 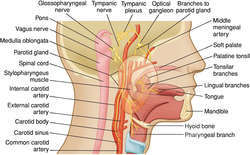 The accessory nerve supplies many muscles in the PALATE, throat, LARYNX, neck, back and upper chest. 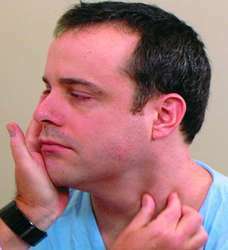 Damage to an accessory nerve in the neck may cause difficulty in speaking and in swallowing. 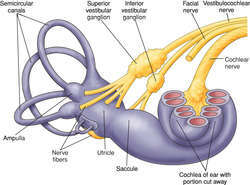 a branch of the VAGUS nerve, occurring in TETRAPODS as the 11th cranial nerve. any gland, other than the gonad, associated with the genital tract, such as the ampulla of the ductus deferens and the bulbourethral, prostate and vesicular glands of the male. Allieu Y, Privat JM, Bonnel F: Paralysis in root avulsion of the brachial plexus: Neurotization by the spinal accessory nerve, in Terzis JK: Microreconstruction of nerve injuries. Pain, quality of life, and spinal accessory nerve status after neck dissection. The spinal accessory nerve innervates the sternocleidomastoid and trapezius muscles. Shoulder function following partial spinal accessory nerve transfer for brachial plexus birth injury. 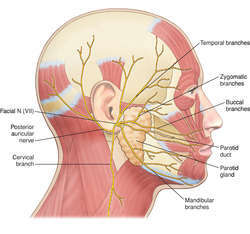 B) To restore hand function, the accessory nerve is connected to the arm's paralysis-affected median nerve, and a still-functioning cervical-plexus (a nerve network emanating from the high cervical region) nerve branch is connected to a paralysis-affected brachial-plexus (a nerve complex that arises from the lower cervical region) branch. Tatla T, Kanagalingam J, Majithia A, Clarke PM: Upper neck spinal accessory nerve identification during neck dissection. Duplication of internal jugular vein and relation to the spinal accessory nerve. This subluxation pattern, known as Hatcher-Murphy Subluxation (HMS), shows manifestation or dysfunction of the tissues involving the brainstem, the vagal nerve or cranial nerve 10 and the spinal accessory nerve or cranial nerve 11. Trapezius dysfunction as a result of spinal accessory nerve injury is another common cause. Compressive neuropathy of long thoracic nerve and accessory nerve secondary to heavy load bearing. The sternocleidomastoid muscle is supplied by the spinal part of the accessory nerve. Ashley was subsequently diagnosed as having a probable severed spinal accessory nerve in the area of her neck. Can Successful Malpractice Plaintiff Sue Re Informed Consent?